My Dream for Disney: Live Bus Updates | What's the Point? Have you ever come across a cool technological advancement or a luxury that you wish Disney would incorporate? Disney is always pushing the technology button, moving to more automated systems to (in theory) make our lives easier and make our vacations stress-free. In Walt Disney World, they've debuted FastPass+ and My Disney Experience for this reason. symbols are buses on the route. Over the past few years, the New York City MTA (Metropolitan Transit Authority) have debuted a number of smart phone apps that have made my life substantially better. 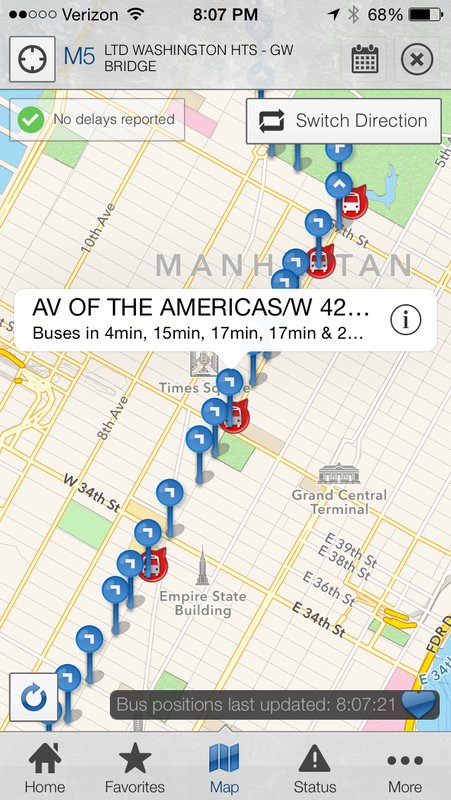 One such app is called "Bus NYC." On this app, I am able to save my morning bus stop and my favorite routes. I then can view the timetable of when the buses are supposed to arrive. While this is helpful, anyone in New York City knows that traffic can throw a massive wrench in those plans. Instead of relying on timetables, I can view the GPS location of the buses on that particular route. Therefore, I don't leave my house in the morning before I can see my bus on approach. In fact, I've timed it out perfectly. On a rainy day, or a cold snowy morning, I don't leave my house a minute before I have to. How can this be applied to Disney? Imagine the possibilities! Imagine you're staying at Disney's Animal Kingdom Lodge and you have dinner reservations at the Hollywood Brown Derby in Disney's Hollywood Studios. Your little one just woke up from a much-needed nap and is dragging a bit. You are rushing to get ready and you check your app. You see the next Hollywood Studios bus about fifteen minutes away, so you can take your time to get ready before running to the bus stop. Or imagine this: You're at the bus stop waiting for the Magic Kingdom bus at Port Orleans French Quarter when your little one tells you that you the he has to use the bathroom. "It's an emergency!" he proclaims. You check your app and see that you have a least five minutes before the bus will arrive so you carry him into the lobby bathroom to take care of business. So Disney Imagineers, if somehow, someday, you read this, please come up with a system like this for Walt Disney World! Guests would be eternally grateful! This is a FABULOUS idea. And now that I own a smartphone, I WANT THIS APP!!! Maybe YOU could create it for Disney! You'd be famous. And while you're at it, can you create a cool Disney trip countdown app? I can't seem to find a decent one. Thanks Heidi! I could be a millionaire if I didn't spill all my ideas here. :) I haven't found a good countdown app either - let's do it together! I've spent the last hour searching for a good countdown app. Quite frankly, I'm kinda disgusted with the lack. Are you on Android or iPhone? 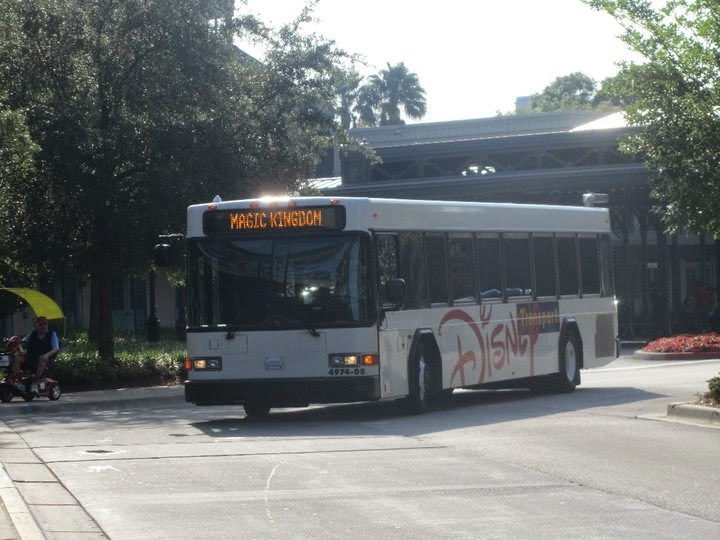 This is a fabulous idea, but Disney buses are a lot more nimble than NYC buses. If there are a million people waiting for an MK bus at one resort, dispatch can re-route a bus so no one waits too long. There are also several buses that don't have a designated stop, especially late at night, so the bus driver can take whoever is waiting at a particular park. Very true! I think this would be more helpful midday than say, the end of the night at MK after Wishes. At that point, you get to the bus stop asap and they dispatch buses as needed.